Bird Spikes are used to prevent large birds such as pigeons, gulls and crows from landing on flat or curved surfaces. Bird spikes do not harm birds, they simple create an uneven surface that birds cannot land on. Installing bird spikes is an effective, humane and economic solution for preventing birds from landing. 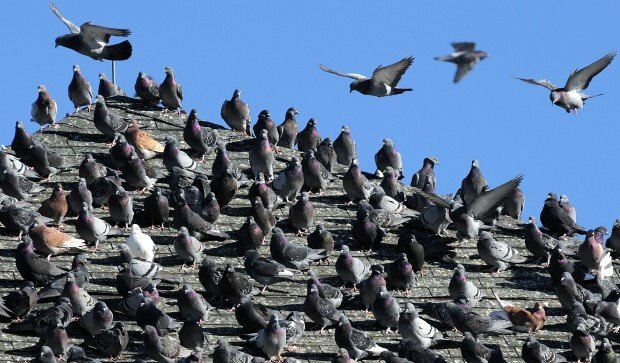 Residents in a Kentucky town are saying “Get the flock out of here” to thousands of black birds that fill the sky each night. At dusk, the birds take flight in La Grange, Ky., and create what some locals describe as a “cloud of birds,” according to TV station WAVE. The birds nest down in a wooded area for the night and depart each morning in a huge pack, reports said.